As we develop courses, sometimes it’s easy to get focused on certain details and lose sight of the overall course quality. Or sometimes, we just want to revisit an older course and ensure that it’s still up to our modern standards. Whatever the reason, it’s useful to conduct a course audit every now and then to make sure that throughout the course we’ve hit all the features that make a course effective, enjoyable, and functional. This article will review some of the things you should go over in your courses. At the end will be a downloadable checklist you can use with all your courses to get an easy overview of areas of strength and weakness in your courses. This area refers to the actual training material throughout the course. It can include learning objectives, text content, and the general training content of the course. The content of the course should be clear, concise, and relevant. You can help define the purpose of the course and make sure it stays on track by creating learning objectives. These objectives will also guide the learner with what they should be getting out of the course, so they should be well-written. The course material also needs to follow through on the promises of the learning objectives by delivering content that aligns with them. The flow of the content contributes to the quality of the course as well – whether it flows logically and makes the material easy to follow for the learner. Some other factors to look out for are whether the course material is up-to-date, and is properly cited with authoritative sources. The importance of user experience in elearning is widely accounted for. Great user experience keeps learners engaged, and it also brings positive associations to training that helps foster a learning culture at their place of work. Plus, it reduces frustration and ensures that it’s possible for learners to properly complete courses. User experience is a fairly technical area of course quality. As important as it is, quality checking it also sometimes involves a certain amount of the more tedious tasks: making sure all the course links work, or ensuring the code on the page is accessible to those who use screen readers. User experience also covers navigation of the course. This includes the navigation bar and menus, but can also cover clarity of directions or ensuring all assignments and activities have instructions so that learners know what to do when they approach a new kind of activity in the course. The performance of the course also affects user experience; the course should load quickly and run on all the popular browsers and on mobile. One great way to help you evaluate user experience is to include an outside perspective. Have someone who wasn’t involved in the creation of the course attempt to navigate through it. They can take notes on anything that was confusing. Even seemingly small complaints like “I wasn’t sure where to click to get to the next page” or “there were so many buttons I didn’t know what to click first” could affect potentially thousands of learners taking the course. It might also be worth using a screen reader to attempt to navigate the course as well. Many instructional designers have never seen how a screen reader works before, and after using one, it will enable them to understand the ways they can help those who use them complete a course. There are also many ways you can test a webpage for readability for those with color blindness. Quality instruction takes into account the diverse personalities that will be interacting with and learning the material. The quality audit area of user engagement helps ensure that people with different backgrounds and learning styles can all connect to the course. The course should have graphics to appeal to visual learners, interactions and gamification for kinesthetic learners, and video components for auditory learners. Engagement also has aspects that affect everybody, such as using different types of activities to break up the course and make it less tedious to participate in, and chunking material to make it easier to consume. Progress bars or point systems so that learners can visualize their progress in the course are also a great way to increase engagement. Course design is arguably an aspect that ties into many of the areas, but it deserves its own separate section. The Internet is a beautiful place these days, with user friendly visuals everywhere. Learners have come to expect high-quality aesthetics as a part of an engaging user experience. We have a big guide on web design for elearning, but what it comes down to is keeping it relatively simple and consistent. Use the same, easy-to-read colors and typefaces throughout the course and use consistent layouts on every page. While you should use plenty of graphics for user engagement, doing too much can crowd the page. Using plenty of white space is an easy way to get a clean, professional look. You can achieve this by breaking up material using plenty of bullets, line spacing, and space between paragraphs. A good rule of thumb is to break any page that is starting to look crowded into two separate pages in your module. Data is king, and it looks like it will only become even more important as L&D departments have to prove KPIs and ROI to stakeholders. Therefore, the final area of course quality is measurement. Measurement should be one of the first things you think about when planning a course, but even if you don’t, there are ways to make it a part of the modules. Create a plan to gauge achievement of the set learning objectives throughout the course. Also include pre- and post- course assessments so you can judge the effectiveness of the course. Knowledge retention can also be measured periodically after the conclusion of the course. You should give opportunities for both the learners and instructors to get course feedback, so make sure those systems are in place. If you have an LMS, there are easy ways to set up your LMS to automatically take measurements in support of the Kirkpatrick’s Model. Working in talent development can be chaotic, and a course quality audit is a great way to take a step back and keep your courses on track and at the level they need to be help show that you’re meeting (or exceeding) KPI and ROI goals in your organization. 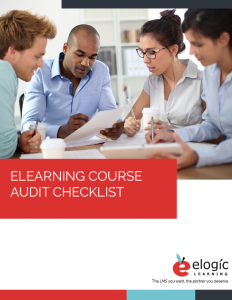 This worksheet is designed to help prevent you from overlooking any crucial areas of elearning course quality. Examine factors related to design, user engagement, course material, and more.